MMOGs are starting to participate in a new system which gives away virtual items to customers that promise to pay for them later. 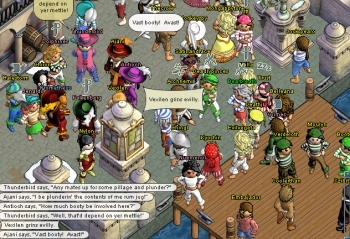 The business model of the free to play MMOG typically relies on the purchase of virtual items by a percentage of the game's user base. For example, players can purchase items that change their in-game characters cosmetically, or those that might help them level up faster for the next 24 hours. There are many consumers out there that don't have the ability to pay for these items online, so Kwedit Inc. has come up with a new method. Kwedit works just like a person's credit in real life, but in the virtual world. A player can promise to pay for a virtual item later when they get the chance, and can receive it right away without waiting. Kwedit can be repaid in a variety of ways, such as at 7-11 stores, or through the mail. If players do not pay back their Kwedit within a certain amount of time, their Kwedit score will go down and they won't be able to use Kwedit as much in the future. The new system is similar to the pre-paid cards that people can already purchase in stores, but Kwedit is more flexible. Nexon, which runs free to play MMORPGs such as Maple Story and Dungeon Fighter Online, believes that these cards are good enough, but acknowledges that sometimes a player of one of their games might want to buy something in-game when a store isn't open or doesn't have the proper card in stock. Kwedit would allow this player to get the item they want right now and to just pay for it later, which would keep them playing rather than possibly switching the game off and doing something else. An entirely new group of customers could potentially be created with the Kwedit system. So far, only two publishers have signed on with Kwedit: FooMojo for FooPets and Three Rings Design for Puzzle Pirates. Daniel James, CEO of Three Rings Design, believes that if Kwedit can even increase the conversion rate of paying customers by a small percentage, it would easily be worth the trouble. If people don't pay, they probably wouldn't have paid anyway, and Three Rings isn't out anything but a few lines of code. The system is still too new to determine whether it's working or not, but people are reportedly already making Kwedit promises. Kwedit is an interesting idea that could also allow players to figure out if they want to pay for virtual goods at all. It's not easy to go over the hump to purchase a virtual item, even when that hump is only a few dollars. With Kwedit, players could learn for free if that 24 hour XP scroll is worth it, or if having an in-game afro makes them feel as good as they hoped. It could also potentially prevent a few people from ruining their actual credit scores in the future, when they see the damage they've done to their Kwedit in the hopes of becoming the best Puzzle Pirate.